How can I embed a Google Analytics tracking code in my "thank you" page? I understand that I can create my own "thank you" page for a form and embed the Google Analytics tracking code there. But this is a hassle since 1) people may get access to the thank-you page by a method other than submitting a form, skewing my results 2) I will need to view and edit the thank-you page, skewing my results and 3) now I have to maintain the form and its corresponding thank-you page using two different systems. It would be wonderful if JotForm could just allow me to embed my Google Analytics tracking code in the "Thank you" page that JotForm generates. This would make things a lot cleaner. The only reason I use JotForm is to get results and grow my business, and I would sure like it if measuring those results (i.e., form submissions) was a lot easier. Thanks! Hello. The alternative solution that I could give you is coding your thank-you page using PHP. This way, you can set a referring page that if the visitor came from your form, it will show the thank you message content on the page. But if not, it will show something different. I hope this makes sense. I can help you make this page if you like. I will also make a feature request to be able to allow google analytics tracking codes to be embedded to Thank you messages. Unfortunately, I cannot guarantee that this can be implemented anytime in the near future as our developers are pretty busy working with other projects that are already in the pipeline. But as soon as we get updates, we'll inform you right away. It does not even have to be PHP. Just create the thank you page as a simple HTML page on your own site, add Google Analytics code and make the form point there. That'd be my recommendation. Now Google analytics have the Trancking Event Option, and is almost mandatory have a enter your GA Event tracking code in this button. Is very frustrating complete a form, install and advice that solution will not work. Others services like https://mc4wp.com/ Have this option. Here is the great news for you. We're pleased to announce that today we've released the native Form Analytics feature. 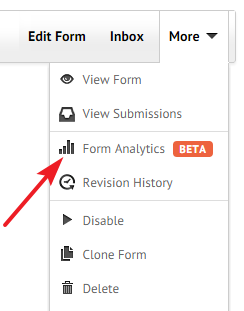 You can access this feature from More menu by selecting a JotForm on your My Forms page. You can now see how many people viewed your forms, how many responded, and where the traffic is coming from. Please give it a try and let us know your feedback.